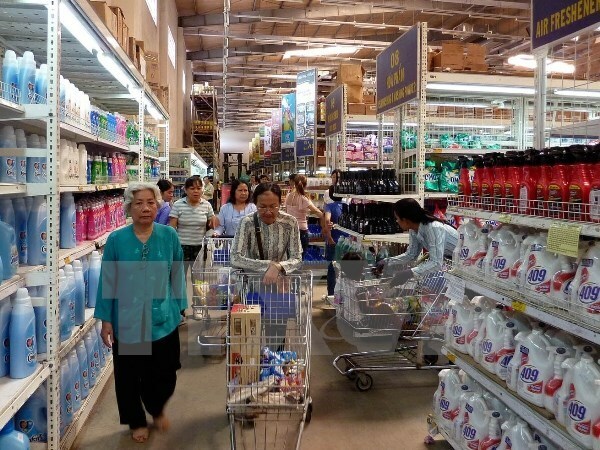 Hanoi (VNA) – The consumer price index (CPI) in August rose 0.92 percent from the previous month and 3.35 percent over the same period last year, according to the General Statistics Office (GSO). An upturn was seen in 10 out of 11 goods and service groups. Medicine and health care services posted the highest increase with 2.86 percent, followed by transportation with 2.13 percent;food and catering services, 1.06 percent;housing and construction materials, 0.93 percent; education, 0.57 percent; and other goods and services, 0.10 percent. Post and telecommunication was the only group that reported a drop of 0.04 percent. Do Thi Ngoc, Vice Director of the Price Analysis under the GSO, attributed the rise in the August CPI to the increase of foodstuff after pork price recovered. In addition, recent floods and storms pushed vegetable price up by 3.89 percent over the previous month, contributing to the CPI increase. In August, gold price fluctuated in accordance with the world gold price, with an average increase of 1.11 percent to reach around 36.4 million VND (1,601 USD) per tael. Meanwhile, the USD price fell by 0.03 percent thanks to the management of the State Bank of Vietnam on the reference VND/USD exchange rate and the abundant foreign currency reserve. Current exchange rate is around 22,700VND per USD. The GSO also assessed that the core inflation in August was up 0.1 percent over the previous month and 1.31 percent year on year. The average inflation in the first eight months of this year was up 1.47 percent, lower than the set target of 1.6-1.8 percent, which showed the stability in themonetary policy.